The demand for security guards in BC is expected to grow, according to Work BC. Now is the time to secure your place in this growing industry. We’ve created this comprehensive guide about BC security guard training to help simplify the process for you. The definition encompasses in-house security guards employed by a business that does not hold a security license, including hospitals, retail stores and universities, loss prevention workers, bodyguards and doorpersons. There are several steps in the BC security guard training and licensing process and the associated forms and requirements must be accurate and complete prior to submitting an application either through mail or online. All forms discussed are available on the Ministry of Justice site. New applicants must undergo security guard fingerprinting at a local police department, RCMP detachment or an approved fingerprinting agency. When fulfilling this requirement for your BC security worker license, use the form titled Request for Fingerprinting Under the Security Service Act (#SPD0507). Complete page one of the form and take both pages to the fingerprinting agency. The “Confirmation of Fingerprinting” section will be completed and given to you. Mail this along with your application. 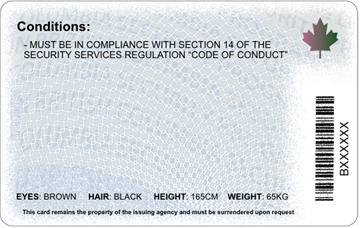 The top half of the form must be sent directly to the Registrar with your fingerprints from the agency. 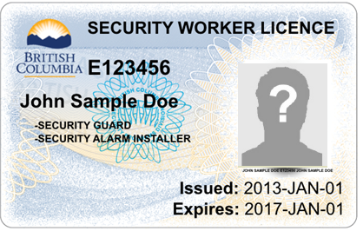 When applying for a BC security worker license, you must also provide the Registrar with an authorization to conduct a criminal record check; a police information check and a correctional service information check when you submit an application form. The Registrar’s office will run record checks upon first applying and at anytime while your license is current. If you have ever been treated or are currently being treated for a mental health condition, your doctor must complete and sign the Mental Health Condition Form (#SPD0511). Your doctor will need to provide certain information. You must then submit the form with your application for your BC security worker license. To become a security worker in BC you cannot be a member of a police force. However, you may be considered if you are a volunteer auxiliary or reserve constable, a sheriff, a corrections officer, a court-appointed bailiff, or a special provincial constable or special municipal constable. If you fall into one of the categories, a letter from your superior disclosing what access you have to any justice, court or police information systems and a statement that you are aware you cannot use information from these systems in your work as a security guard must be submitted with the application. Security guard licenses are contingent upon the fact you are sufficiently fluent in the English language to speak with the public and carry out your duties. If English fluency is brought into question, the Registrar can ask an applicant to submit a copy of the results of an English language proficiency assessment. One of the BC security guard requirements is that you are ordinarily a resident in Canada as shown by your citizenship, residence status and other factors. Documentation must be submitted. Those born in Canada or who have obtained Canadian citizenship must submit a copy of their birth certificate, current Canadian passport or Canadian Citizenship Card. 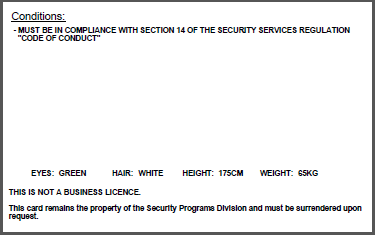 To become a security worker in BC, you must be at least 19 years of age. If your security job will require the use of dogs, you have to request authorization to use dogs from the Registrar, Security Services Act. You must submit a validation certificate to the Registrar from the Justice Institute of British Columbia that proves both you and the dog are properly trained. You must re-qualify each year or every six months if it is a dual-purpose dog. To use handcuffs you have to request authorization from the Registrar, Security Services. Applicants must complete the Advanced Security Training (AST) course offered by the Justice Institute of BC or have equivalent training. This must be taken within one year of applying and you must re-qualify every three years. 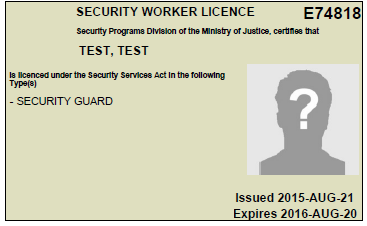 You must submit documentation that you have successfully completed the mandatory BC security guard training (Basic Security Training must be completed through an approved training school), meet the education and experience requirements necessary to receive a license. If your training was conducted outside of the province, or you have done security guard work outside of the province, there is a process to challenge an exam or to demonstrate skills. The Justice Institute of BC can review previous training and experience. New applicants can seek a license after completing the Basic Security Training. Note: If your training was under the past program, BST Level 1 and 2 certificates are accepted as proof of training. Security Professionals working in the province of British Columbia are required to complete mandatory training prior to being eligible for provincial licensing. You must be 19 years of age before you can apply for your Basic Security Training License. Approved Security Training Schools are required to follow the training standards for the security industry as outlined in the Security Services Act. Approved Security Training Schools are listed further down this page. Express expectations of the course. Define “professional” and explain the standards of professional conduct for security professionals (SPs). Define “ethics” and explain its importance in the security profession. Give examples of ethical and unethical behaviour on the part of SPs. Define “customer service” and explain its importance in the security profession. Describe the difference between private security and the police. List the types of jobs that SPs could do. List the basic duties of SPs. List the types of incidents to which SPs might have to respond. Explain the basic steps in responding to incidents. Explain the guidelines for incident scene protection. Describe the role of emergency services and regulatory agencies. Explain the authority of emergency services and regulatory agency personnel on private property. Define “law” and state the function of law. List the federal and provincial laws that provide a legal framework for SP duties and powers. Explain the purpose of the Canadian Charter of Rights and Freedoms. Explain the SP’s responsibilities and limitations under the Charter. Explain the impact of human rights legislation on the SP’s performance of his or her duties. Define key terms used in reference to criminal offences. Identify the essential elements of common offences. Regulation that have a direct impact on SPs. Identify other legislation that have a direct impact on SPs. Describe the SP’s powers and limitations under the law. Explain the benefits of an SP’s notebook. Explain the guidelines for effective note-taking. State the rules for maintaining a notebook. List the parties who may access an SP’s notebook. Explain how an SP’s notebook may be used in court. Write effective notes about an incident. Explain the purpose of a report. List the instances when a report must be written. Describe the characteristics of an effective report. Describe the elements of a safe interview stance. Describe the various relative positions that could be used in an encounter. Explain the importance of continuous assessment. State the goal and benefits of tactical communication. Explain how tactical communication fits in the National Use of Force Model. Apply three major tactical communication strategies. Describe the desired outcome of tactical communication. On completion of the online training, students must pass a final written exam with a score of 60%. This is not available online and must be written in person. Regularly scheduled exams are held in the Lower Mainland at the JIBC New Westminster Campus. Out of town students will have an exam set up in a location near them but may have to wait up to three weeks. Your online administrator will contact you by email or phone to confirm exam details. Security Training Programs administers mandatory security training in British Columbia on behalf of the Ministry of Justice and the Security Services Act. As of April 12, 2016 the current security industry licenses and permits will be upgraded with new security enhanced licenses and permits that meet the current government quality standards. All current licenses and permits in the previous style will continue to be valid until their expiration date. The example below shows a comparison of the licenses issued prior to April 12, 2016 and the new security worker licenses. Once you have completed all of the forms associated with the requirements above and have paid the associated fees, you may submit your application for a security guard license. Be sure to double-check everything or the process can be delayed.